What's Good for the Goose - CHARTER SCHOOL WATCHDOG http://www.charterschoolwatchdog. If you have been following our website, you will know that a pregnant Chicago teacher was recently fired from one of the "Gulen-inspired" schools in Chicago, because she help with unionize the school (she had some silly idea that that the teachers should have equal rights and pay, etc.). 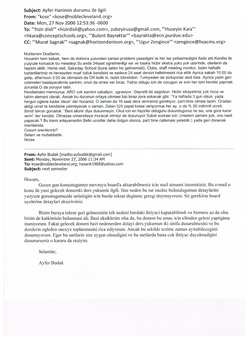 Well, we found an interesting email that speaks to the discriminatory practices that the Turkish guys are so fond of, and in this particular case, when it comes to "motherhood." 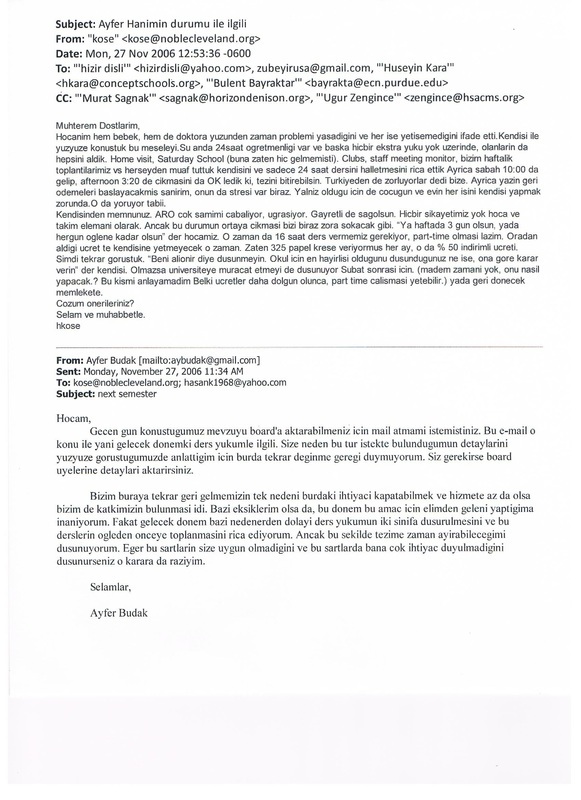 It seems, according to this email, that the "brothers" are more than okay with a Turkish mother/teacher having her hours reduced and all extra-duty teaching activities suspended so that she can take care of her child and finish her thesis (which we guarantee is being funded through the school == tax payer funds). Now we know of several instances where pregnant American teachers were hassled just because they had to schedule doctor appointments during school hours (and that would be courtesy of Sagnak, the former HSA Denison director and Noble School board member), and yet, the boys are more than happy to give their Turkish "sister" pretty much anything and everything that she requests, for the good of the "organization." In the formentioned cases, the American teachers were not excused from any type of duties, nor did the Director(s) have any sympathy over the fact that some of those same women were single, supporting familes, and had to also deal with child care issues. In her plea to the Board members, Ayfer states that if she cannot get a reprieve from so many teaching hours, etc., that she will be forced to go back to Turkey. Well, here's our advice, don't let the plane door hit her in the popo on her flight home to Turkey. We have many unemployed American teachers here that would be happy to take over her teaching duties and be paid to go to school with taxpayer funds (the ones that are paying into). Below is the original Turkish version and the English translations. By the way guys, if you find any issues with our translations, feel free to contact us for revisions, we are always happy to hear from you guys. The English translations are in red. Hocanim hem bebek, hem de doktora yuzunden zaman problemi yasadigini ve her ise yetisemedigini ifade etti. She said that she does not have enough time because of her baby and graduate studies so she cannot do everything. Kendisi ile yuzyuze konustuk bu meseleyi. We talked about it face to face. Su anda 24saat ogretmenligi var ve baska hicbir ekstra yuku yok uzerinde, olanlarin da hepsini aldik. Home visit, Saturday School (buna zaten hic gelmemisti). Clubs, staff meeting monitor, bizim haftalik toplantilarimiz vs herseyden muaf tuttuk kendisini ve sadece 24 saat dersini halletmesini rica ettik Ayrica sabah 10:00 da gelip, afternoon 3:20 de cikmasini da OK ledik ki, tezini bitirebilsin. Now, she has only 24 hours of teaching duty and she does not have anything else, We exempted her from all other duties, home visits, Saturday School (anyway she never came) Clubs, Staff meeting monitor, our weekly meetings etc. We exempted her from them and we asked her to teach 24 hours per week. Also, we will allow her to come to school at 10 in the morning and leave at 3:20 afternoon so she can finish her graduate thesis. Turkiyeden de zorluyorlar dedi bize. Ayrica yazin geri odemeleri baslayacakmis sanirim, onun da stresi var biraz. Yalniz oldugu icin de cocugun ve evin her isini kendisi yapmak zorunda.O da yoruyor tabii. She said that she is being pushed from Turkey and I guess that her payments start in the summer so she is stressed. Since she is alone, she has to do homework and take care of her kid by herself, so it tires her. Kendisinden memnunuz. ARO cok samimi cabaliyor, ugrasiyor. Gayretli de sagolsun. Hicbir sikayetimiz yok hoca ve takim elemani olarak. We are happy with her and may Allah be pleased with her, she is working hard. We don’t have any complaints about her as being a teacher and a colleague. Ancak bu durumun ortaya cikmasi bizi biraz zora sokacak gibi. “Ya haftada 3 gun olsun, yada hergun oglene kadar olsun” der hocamiz. But this situation is going to be hard for us. She said that "Either 3 days in a week or each day until noon." O zaman da 16 saat ders vermemiz gerekiyor, part-time olmasi lazim. That means we have to give her a schedule of 16 hours per week so it has to be part-time. Oradan aldigi ucret te kendisine yetmeyecek o zaman. Zaten 325 papel krese veriyormus her ay, o da % 50 indirimli ucreti. Then, her paycheck will not be enough for her. Anyway, she pays $325 to daily care each month and it is with a %50 discount. Simdi tekrar gorustuk. “Beni alionir diye dusunmeyin. Okul icin en hayirlisi oldugunu dusundugunuz ne ise, ona gore karar verin” der kendisi. We have just talked again. She said that "Don't think that I will be offended. Do the best thing for the school and decide according to that"
Olmazsa universiteye muracat etmeyi de dusunuyor Subat sonrasi icin. (madem zamani yok, onu nasil yapacak.? Bu kismi anlayamadim Belki ucretler daha dolgun olunca, part time calismasi yetebilir.) yada geri donecek memlekete. Otherwise, she thinks she will have to apply to university after February. (If she does not have enough time, how is she going to do that?) I did not understand that maybe if the salary is higher over there, it is enough to work part-time) or she will return to homeland. Gecen gun konustugumuz mevzuyu board'a aktarabilmeniz icin mail atmami istemistiniz. Bu e-mail o konu ile yani gelecek donemki ders yukumle ilgili. Size neden bu tur istekte bulundugumun detaylarini yuzyuze gorustugumuzde anlattigim icin burda tekrar deginme geregi duymuyorum. Siz gerekirse board uyelerine detaylari aktarirsiniz. Bizim buraya tekrar geri gelmemizin tek nedeni burdaki ihtiyaci kapatabilmek ve hizmete az da olsa bizim de katkimizin bulunmasi idi. The reason why we came back here is to help the organization as much as we can. Bazi eksiklerim olsa da, bu donem bu amac icin elimden geleni yaptigima inaniyorum. Even though I have some shortcomings, I think that I did my best this semester. Fakat gelecek donem bazi nedenerden dolayi ders yukumun iki sinifa dusurulmesini ve bu derslerin ogleden onceye toplanmasini rica ediyorum. But, for next semester, I want to only have 2 classess for some personal reasons and teach those classes before noon. Ancak bu sekilde tezime zaman ayirabilecegimi dusunuyorum. I need to have enough time to work on my thesis. Eger bu sartlarin size uygun olmadigini ve bu sartlarda bana cok ihtiyac duyulmadigini dusunurseniz o karara da raziyim. If you think that my conditions are not okay with you and under these circumstances, if you think that you do not need me much, I will be happy with your decision too. Check out the cast of characters in the emails (the Board Members). Many of the names can be found in other emails on this website -- after all, it is just one big happy "brotherhood."